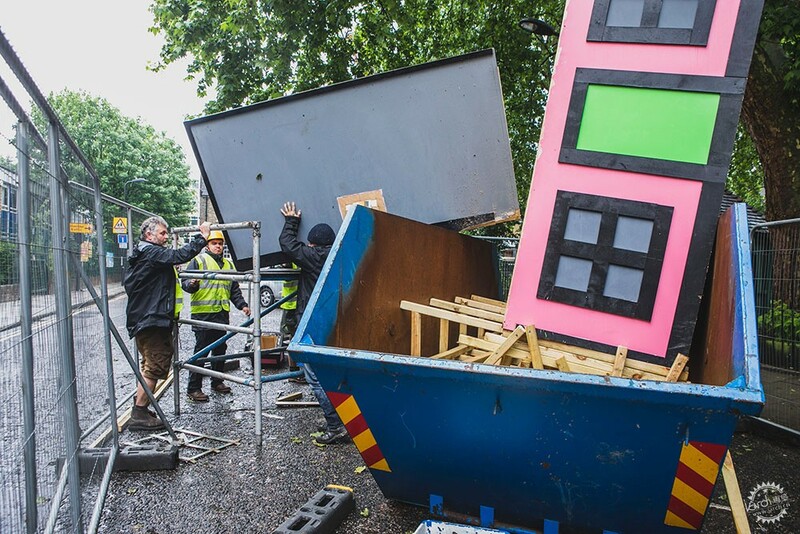 British artist Richard Woods has put one of his colourful bungalows in a roadside skip in London's Hoxton Square, in a bid to trigger discussion about gentrification during the London Festival of Architecture. 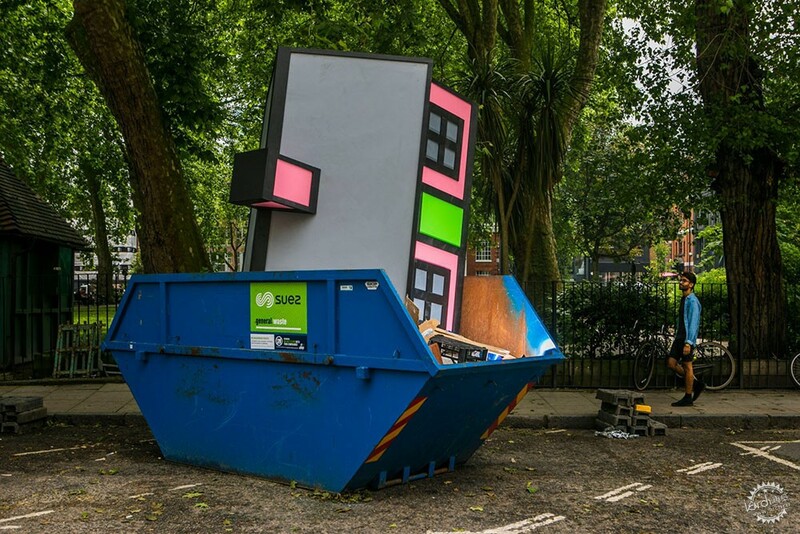 Called Upgrade, the installation sees one of the colourful holiday homes that Woods presented at the Folkestone Triennial last year dumped on its side in a skip, along with a load of trash. His aim is to draw attention to the radical changes that east London has experienced in recent years, to question whether this should be seen as a good or bad thing. "As a student at the Slade School, I spent many hours walking the areas north of King's Cross," said Woods. 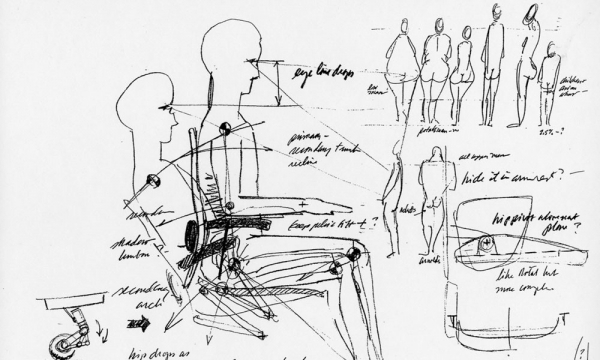 "I would look for skips containing plywood that I could drag back to Gower Street Studios and make into sculpture." "Many of these skips contained kitchens or three-piece suites," he continued. "By proposing that a whole house could be cast aside and put into a skip, I am highlighting and exaggerating this process of gentrification." 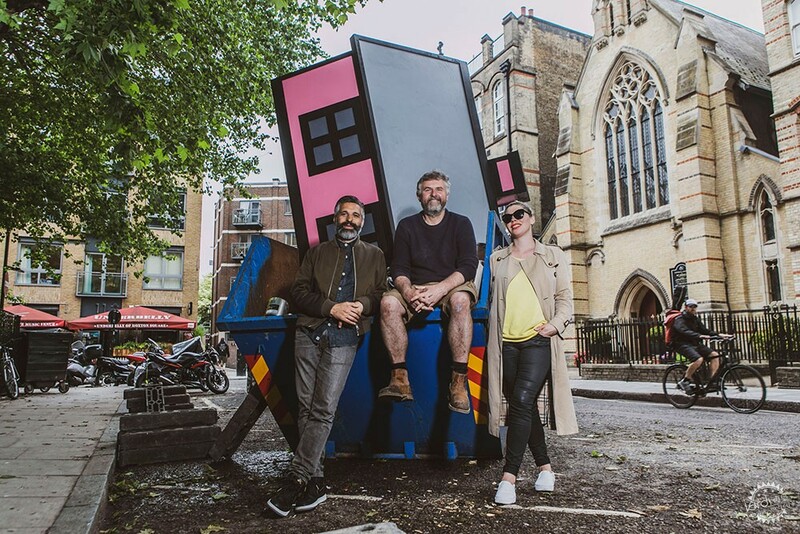 Woods' installation is the latest project from Skip Gallery, a nomadic arts organisation founded by Catherine Borowski and Lee Baker, which has showcased a range of site-specific artworks in skips across London. 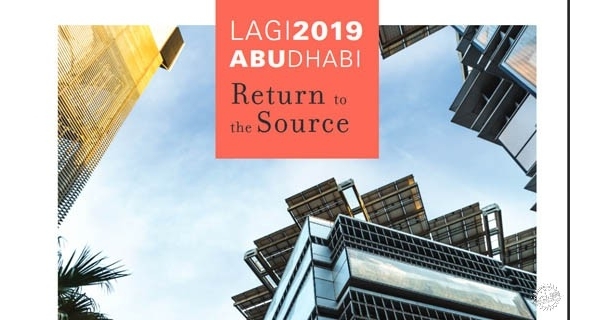 Its aim is to highlight the "throw-away culture of the city". 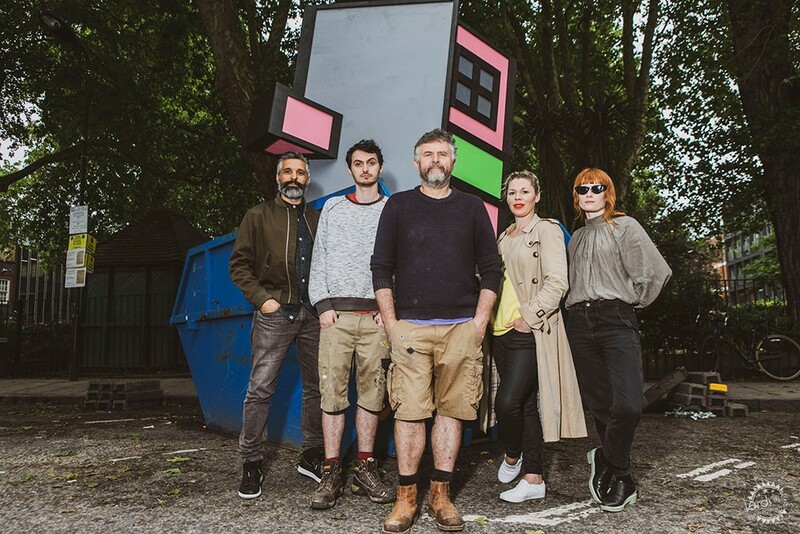 Other artists it has worked with include David Shrigley, who presented his metal sculpture Look At This, and Ben Eine, who created a graffiti installation inside the skip. 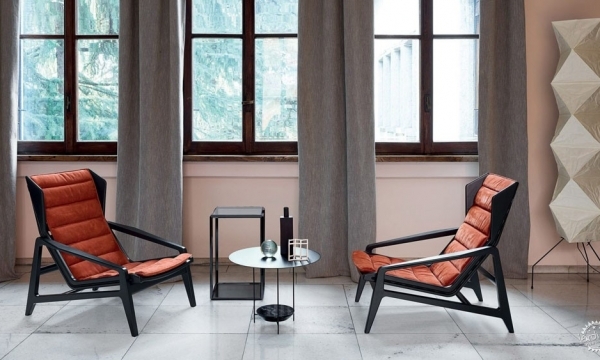 Woods originally created six of the colourful bungalows, which feature his trademark cartoon style, seen also in his furniture for Established & Sons and in his own home. He installed these in various locations around seaside town Folkestone, to encourage people to think more carefully about the social implications of multiple-home ownership. 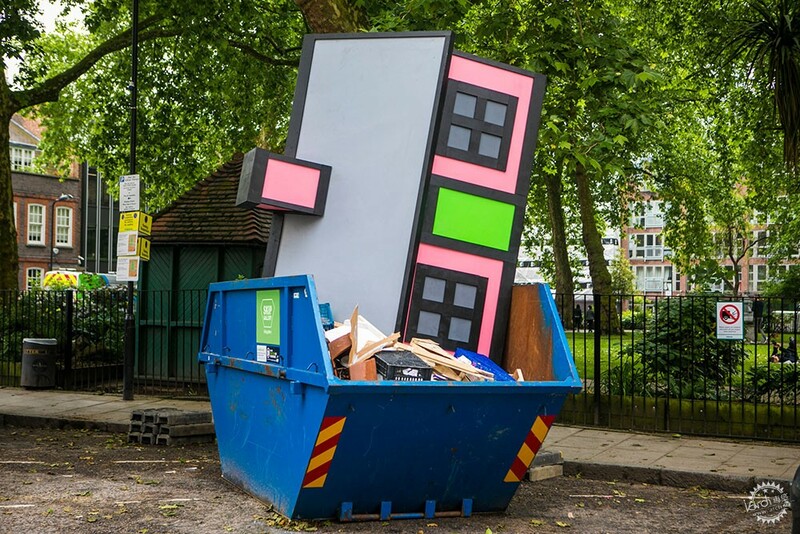 He chose to recycle just one of these for the London Festival of Architecture, in response to this year's theme "identity". The house is neon pink, with a lime-green door and thick black outlines. It is designed to look like a traditional British bungalow, but it is approximately a third of the size of a standard house. Upgrade is on show at Skip Gallery in Hoxton throughout the London Festival of Architecture 2018, which takes place from 1 to 30 June. Dezeen is media partner for the event.